Two New Contracts with NCP! Grania Burns is a dragon-shifter—Dylan Lightfoot is the wizard she’s taken an oath to protect…their alliance will kindle the flames of forbidden love—together they will defeat a great evil and save the mortals of Earth from destruction. Blogging over at the HEA Cafe! Twilight's Kiss given a top pick Rose by Romance Reader at Heart! 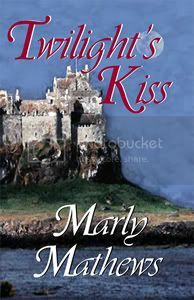 A fascinating tale, TWILIGHT'S KISS is a wonderful romance that captivates as it spins its magical tale of love and destiny. Exciting vampire staking action and many surprises makes TWILIGHT'S KISS a book you can't put down. It also makes it easy to recommend this book to everyone that enjoys passion and excitement.